Supercubproject.com provides the following drawings for entertainment use only. There is no warranty or guarantee the accuracy, quality, currentness or completeness of the information. Supercubproject.com will not be responsible to you for any claim, loss, expense, or direct or indirect consequential, special, incidental or punitive damages of any kind, or any damages whatsoever, that you may suffer in connection with this information. Folks, this information is here for casual reference and I cannot promise you anything as far as accuracy. Use at your own risk. 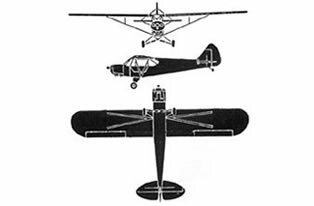 I am building an experimental Cub and thought others might like a convenient reference on the web. Also there are model builders who appeciate this information also. The only way you can use these drawings on my web site is by accepting these terms. If you understand these terms please click "Accept".